Beef shin is not a cut that you hear of much, but its inexpensive and fantastic for slow cooking. This is a wonderful comforting and warming dish that we crave at this time of year, when cooking we leave the bone in as the bone marrow gives extra richness to the dish, just discard before serving. We get our beef from the Ginger Pig, they have shops doted around London they are a fantastic butchers, and we are thrilled to say that they sell beef from Lucy’s family farm in Northumberland – all grass fed and we like to think happy cows that spend their lives on the Cheviot hills. The breeds are Belted Galloways, Black Galloways and a traditional cross called the Blue Grey. They are very old breeds from the Scottish Borders which are slightly smaller than most commercial cattle and take longer to grow. This is due to their being entirely grass fed and have not been given any artificial fattening feed, which is also very economical to the farmer. We are just coming to the end of the grass fed beef season (because they don’t come in doors and they breed the same time every year). However you can still get very good quality traditionally reared meat out of season so don’t be put off. Turnip is a funny old veg, sadly often brings up memories of stodgy school dinners but its easy to spruce up - they are very inexpensive and are in abundance at this time of year. This is one of our favourite ways of serving it, and it does not just have to go with the stew we have here – it is great chicken, lamb or just your sausages and gravy. Turnip is also great roasted, and it is such a help that you don’t have to pre boil it like potatoes – chop it up with other root veggies and roast in the oven with garlic and herbs. The ragu, just like other slow cooked dishes is best cooked in advance as the flavours will develop and come together. We quite often do it overnight, the only thing is you wake up to a rather strong smell of beef in the kitchen in the morning, makes one feel rather queasy on a hangover. 1. Heat the oven to 220c for the Turnip mash 2. Heat a casserole pan over a high heat and seat the beef shins so browned all over and place to the side. Lower the heat and add the onion, leek, fennel, ginger, garlic, bay leaves, and thyme and sauté for 5 minutes. 3. Add the cinnamon, cayenne pepper, cumin seeds and mix to release the flavour then add the meat back in, mix then add the wine, stock, porchini and the bones. Put the lid back on and lightly simmer for 3 – 4 hours, till it is falling apart. 4. In the meantime make the mash. Put the turnip, garlic and thyme in a roasting tin and drizzle with olive oil, salt and pepper. Roast in the oven for 20 minutes. Once cooked put into the food processor with the butter and crème friache and pulse, check the taste and season if necessary. 5. Back to the ragu, remove the bones and add the mushrooms and prunes, and season, cook for a further 10 minutes. 6. 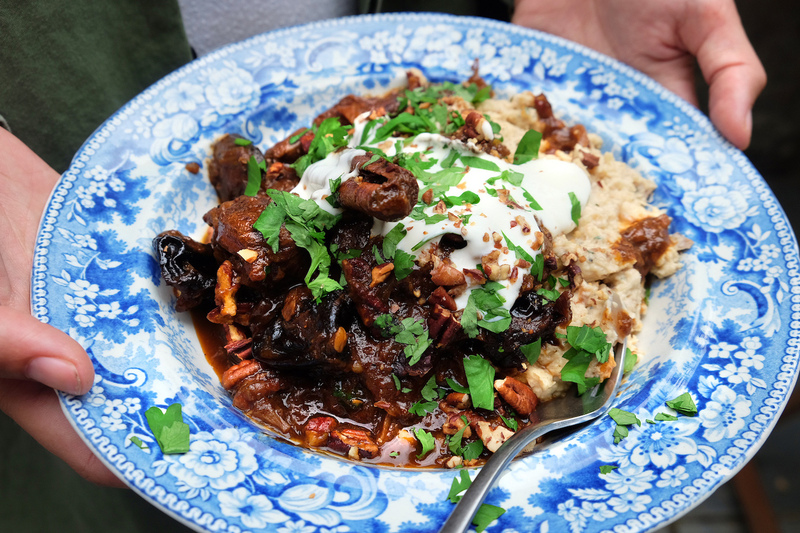 Serve in a bowl with a dollop of the mash, then the ragu with pecans, coriander and yoghurt.